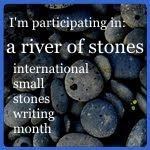 Today I have decided I’m taking part in A River of Stones throughout January. This involves noticing and writing down (succinctly) one thing every day. I did something similar last year. I attempted a Haiku every day for a few months. But, even though I enjoyed that and still love Haiku, I think this will be more fun for me. Haiku come with varying and debatable sets of rules about lines, syllables and imagery which I found a little frustrating and occasionally depersonalising. Thanks to Fiona and Kaspa for organising this. It’s a superb idea.